(CNN) -- Professor Michael Wesch should be flattered. Working out how they use tech is an increasingly studied area for companies employing digital anthropologists. A cultural anthropologist at Kansas State University, over the past few years he's received a hundred-plus requests from people around the world eager to enroll in the school's graduate program for "digital ethnography," a subject that he's known for. One problem: no such program exists. Wesch teaches anthropology to undergrads and heads up a working group on digital ethnography. The demand for his non-existent grad program is perhaps indicative, though, of a rising interest in the subject -- and in the skill. As trained observers of how people in a society live, ethnographers can help companies figure out what people need and then work with designers to meet those needs with new (or more often tweaked) products and services. In a world in which ever more people are using technology products on a daily basis, such skills are increasingly in demand. For ethnographers, anthropologists, and other social scientists, the upshot can be intriguing work around the globe. Take Olga Morawczynski, a 20-something University of Edinburgh doctorate student who recently spent over a year in Kenya, where she studied the use of M-Pesa, a system for transferring money by cell phones. Her research, which shows how M-Pesa is affecting family relationships and other aspects of daily life, was funded by a joint scholarship from the university and Microsoft Research. The latter has also offered her an internship in Bangalore that will begin in a few months. If she enjoys the work and being in India, notes Morawczynski, "then an offer for something more permanent would be great." But otherwise she'll likely have plenty more opportunities from which to choose. "Microsoft and many other companies realize that since it is, after all, people who use technology, it's critical for the company to understand how people adapt to technology," notes Kentaro Toyama, who leads the Technology for Emerging Markets research group at Microsoft Research India. That helps explain why, as Wesch notes, digital ethnography is increasingly being integrated into other majors at universities. Toyama recalls a previous intern named Joyojeet Pal, who was then working on a doctorate in city and regional planning at the University of California at Berkeley but was also versed in ethnography. During his internship Pal helped Toyama and others at Microsoft realize the significance of a practice commonly seen in rural India. He showed how students at overcrowded poor schools usually shared a PC, the result being that the oldest or pushiest often controlled the mouse while others lost interest. Microsoft responded a few years later with a technology called MultiPoint, which allows for the use of multiple mice on one machine. It's since steadily increased its investment in MultiPoint, notes Toyama, and today in India, Vietnam, Chile, and elsewhere the dominant use of it is as a way to quiz primary school students in multiple-choice questions. The social component of interaction might actually be better than having students each with their own PC, notes Toyama. Even in the developed world, this might prove beneficial in classrooms. Where MultiPoint will go in the future is anyone's guess, but something that started with ethnographic observations in rural India four or five years ago has already gone international. Something similar happened with Nokia's 1100 handset model, but on a much bigger scale. Its features make it ideal for the developing world, among them a long battery life, a rugged dust-proof construction, and a built-in flashlight. Once marketed as being "made for India," the handset quickly proved widely popular in the developing world and beyond. It now ranks as one of the top all-time sellers in consumer electronics history. A feature like a built-in flashlight might hold little appeal to someone living in Tokyo or London. But in places where electricity is hard to access, it can be tremendously useful. 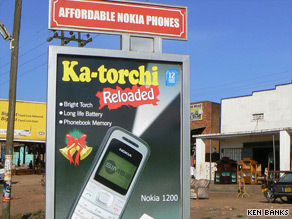 Ken Banks, an anthropologist and tech expert who developed the mass messaging program FrontlineSMS, points to a sign in Uganda he photographed advertising the Nokia 1200. Its main focus? The "ka-torchi," or flashlight. In much of the developed world, notes Banks, the market for cell phones has been saturated. That means manufacturers must figure out what people in the developing world -- where growth will be strongest -- really need from a phone. "It's not just a financial thing for them," says Banks. "People are only going to invest in a phone if they see real value in owning it." So observations made in India -- that people hold up their phones at home to see their keys and such at night -- helped Nokia create a global blockbuster. The success of M-Pesa in Kenya has prompted similar mobile money offerings around the world -- there are now over 120 -- and could eventually have a significant impact on the enormous global remittances industry. Little wonder, then, that Nokia and other tech companies employ anthropologists to travel around the world observing how people interact with technology. For her part, Morawczynski is eager to escape academia and get more involved in the development and launch of mobile services. "I have spent a significant amount of time studying the people, the technology, and the interactions between the two," she notes. "I have loads of ideas as a result."